Any use of this website’s material or content other than for personal use is prohibited. All website content, including trademarks, photos, texts, icons, logos and other material, is the property of Collège Boréal or third parties. Prior authorization must be obtained before using this material or information for public or commercial use. The information provided in this website may be modified without prior notice. No implied or written guarantee is given. Where links are provided to other websites for information and convenience, Collège Boréal cannot be held liable for the content, products or services of those sites. Likewise, if the user is directed towards sites where software is available for download, Collège Boréal cannot be held liable for potential problems related to downloading. It is the user’s responsibility to exercise good judgment when accessing external links. Collège Boréal cannot be held liable for information, services or products obtained from external sources. The availability of Collège Boréal’s website is subject to occasional interruptions due to technical difficulties or circumstances beyond its control. No guarantee of systematic and continuous access is given. Moreover, to the extent allowed by current regulations, Collège Boréal cannot be held liable for any loss – financial loss loss of data, loss of equipment or other – resulting from the use or the inability to use the service; from unauthorized access by an internet user; or from the actions of a third party using the service. producing or obtaining the production of a TCP/IP packet header or any part of the information contained in an email or discussion group header. Any violation of the system or network may result in civil or criminal liability. 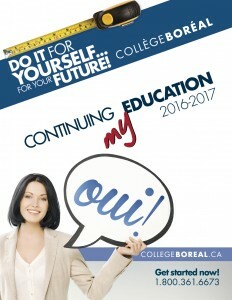 All campuses and locations of Collège Boréal, as well as any premises considered as extensions of the campus in which Collège Boréal exercises authority or organizes activities. Collège Boréal considers its internet, email and phone system as tools for research, communication and learning. These tools provide significant support to students in their studies and to staff members in the performance of their duties. Access to Collège Boréal’s internet, email or phone system is strictly limited to educational purposes. Any other behaviour which is disrespectful of the rights of others or contrary to Collège Boréal’s rules of conduct. Collège Boréal will not be liable for any use of internet and/or other social media (such as Facebook and Twitter) that is unrelated to educational purposes.